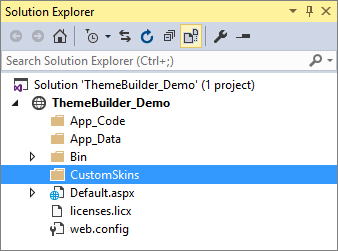 Once you have created a custom skin, you need to download then apply it in your project. This article will walk you through the process. Once you have completed the desired modifications, you can download the new skin as a compact archive using the Download button. Save the downloaded file to be able to customize it further in the future. See the Import section. The following image shows an example for downloading the custom skin. There are several ways of registering CSS files, one of which, would be as simple as Dragging & Dropping the file to a page. Additional ways for registering the CSS files will be described later in this article. We will be using RadSlider and RadWizard to style in this tutorial. To get started, firstly, create a folder anywhere in your Project. We will be using the name "CustomSkins" for our demonstration. Extract the downloaded Theme file (e.g. MySkinName.zip) and copy the content into the folder created in the previous step. Register the stylesheet for the control you intend to style by dragging and dropping the file into the page. We will only include two styles, one for RadWizard and another one for RadSlider. You might need to include all the stylesheets if applying style to all controls. Some of the CSS files generated by ThemeBuilder may include classes with background-image using WebResource URIs that could cause appearance problems. You might remove those classes to avoid appearance issues. The following image shows how to register a stylesheet by Dragging and Dropping the file into the page head. 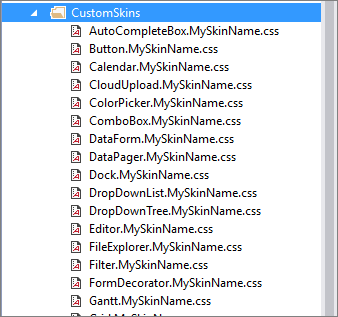 Finally, configure the controls to use the new skins by setting the EnableEmbeddedSkins to false and the Skin property to the name of your custom skin. In our case it is called MySkinName. The following image shows the look of both controls before and after the custom skin applied. Well done! You have successfully Created a custom skin and applied it to Telerik Controls. Declaratively - Using link tags. Optionally, you can make the href attribute of the <link> tag application relative - insert a tilde ~/ - and add runat="server"
You can register the CSS file of the skin by adding a HtmlLink control in the Header property of your Page. The <head> tag must include the runat="server" attribute.